A clutch, backpack, and two-sized over-the-shoulder bag in one everyday design. Say hello to your new sidekick. You'll want this simple yet stylish tote slung over your shoulder—or on your back, or in your hand—on the daily. Roomy enough to hold all the work or play essentials, it easily transforms from backpack to clutch to a bag in two different sizes. That means a little more room in your closet, and a new favorite traveling companion. 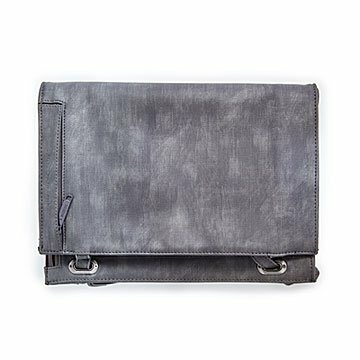 Made from vegan leather in a goes-with-everything gray. Made in China. Opened: 17" L x 11.75" W x 8"